TORONTO (April 25, 2019) – The National Hockey League Players’ Association (NHLPA) announced today the three finalists for the 2018-19 Ted Lindsay Award (TLA) are forwards Patrick Kane of the Chicago Blackhawks, Nikita Kucherov of the Tampa Bay Lightning and Connor McDavid of the Edmonton Oilers. The TLA is presented annually “to the most outstanding player in the NHL,” as voted by fellow members of the NHLPA. HC panel breaks down the Carolina Hurricanes crazy Game 7 win over the defending champ Capitals, to become the final piece in the wackiest 2nd round bracket we’ve every seen in the NHL. Washington always will have Alex Ovechkin, loopy with happiness, diving into that fountain in his droopy drawers. D.C. will always keep its memories of the Save by Braden Holtby in the Stanley Cup finals against Vegas, and T.J. Oshie chugging a brew through his jersey. Most of all, every Capitals fan, from the newest to the “Suffering Since 1974” crowd, will have those massive, citywide bonding moments, gazing last June at a mall jammed into the distance with rejoicing fans, with the Stanley Cup shining. What Washington will not have is back-to-back titles. That dream is dead after a crushing — and far too Old Caps — 4-3, double-overtime loss in Game 7 to the Carolina Hurricanes in the first round of the playoffs Wednesday night at roaring, then utterly despondent Capital One Arena. The season-slaughtering goal was scored by Brock McGinn at 11:05 of the second overtime period. On a sunny September day in his Scotiabank office, amid high hopes of a new season, the glow of the John Tavares signing and more riches to reap from young stars, we asked Kyle Dubas about where coach Mike Babcock fit in. “He’s an elite coach and I expect an elite performance from him and his staff,” was the direct reply from the new general manager. Now, Dubas must define “elite” while a fan base takes much of its anger and on-line vitriol out on Babcock after a second early playoff defeat at the hands of the Boston Bruins. Not yet four full years into his eight-season $50-million contract, some of those who laid palm leaves at his feet when he arrived in Toronto in May 2015 want to put him on the first plane back to Saskatchewan. It will be among the first questions Dubas takes when meeting the media this week. To be clear, Babcock and his staff wear this loss as much as anyone, specifically the inability to close out Boston, despite three months’ advance scouting notice and two shots in elimination games. Babcock’s stubborn lineup format, such as sticking with a fading Patrick Marleau, not extending the first unit’s power play time and inability to fix the penalty kill, were inadequate counter moves to Bruce Cassidy pulling veteran David Backes or a hometown hitter such as Chris Wagner. f you’re interested in learning how basketball is played, you should get a patient coach who can motivate you to become better every day. You’re bound to receive lots of criticism as you continue developing your basketball skills – don’t let it demotivate you. Instead, learn continuously from mistakes and give your 100% during each training session. You can gradually improve your basketball skills if you work hard and remain focused on your goal. You can visit BallersGuide.net to get helpful information on how you can find exquisite basketball training aids within your area. All four wild-card teams advanced. The third team in NHL history to win 62 games in a regular season failed to get even one in the playoffs. The Vegas Golden Knights were up 3-1 in their series, and 3-0 with 11 minutes left in Game 7, but still couldn’t get out of Round 1. Only three of the nine teams to hit 100 points this season are still standing. Just as we all predicted. The first round of the 2019 Stanley Cup Playoffs will go down as one of the wildest, least predictable ever. From a shocking sweep to a couple of overtime Game 7s, the second round has a lot to live up to. Before we move on, we take one look back at some things we learned from the first two weeks of the playoffs. The hottest teams mostly got through. The only team to advance that didn’t win at least six of their final 10 regular season games were the San Jose Sharks, who beat a similarly struggling Vegas in seven. The Lightning were knocked out by a Blue Jackets team surging at the right moment. And the No. 8 seed Colorado Avalanche lost only one regulation game in their final 10, while top-seed Calgary dropped its last two in a row. Finishing strong isn’t always an indication of incoming playoff success. In 2018, the Anaheim Ducks won eight of their last 10 games and were swept by the San Jose Sharks, who finished 5-4-1. And it may actually lose significance the deeper into the bracket you go. Last year’s Capitals finished 8-2-0, but the 2017 champion Penguins came in 4-4-2. 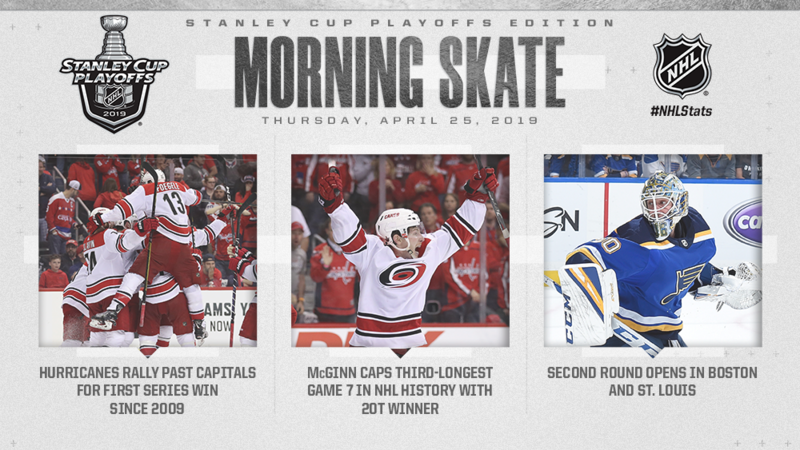 Hurricanes knock off defending champions for first series win since 2009; McGinn caps third-longest Game 7 in NHL history with double-overtime winner; Second Round of 2019 Stanley Cup Playoffs to begin tonight.